Did you know you can now order your Deliveroo takeaway from Vagabond Wines here on View? "An award-winning independent wine shop and 'enoteca', in a quiet and almost-leafy part of Fulham Broadway. We offer a self-serve wine experience to encourage you to discover an ever-evolving selection of great wines. Enjoy 100 wines on tap every day. Contact us for more information on wholesale, bookings, tastings and events." 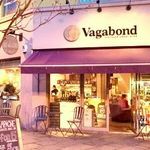 What did you think of Vagabond Wines?